This is a lithograph created by, William L. Breton in Philadelphia, Pennsylvania in 1830. This image shows the home that Robert Morris and his family lived in before he gave it to George Washington when he became president. Robert Morris and George Washington both owned slaves which were kept here. Robert Morris was a Founding Father who signed the Declaration of Independence. He was born January 31, 1734 in Liverpool, England but spent most of his life in Philadelphia, Pennsylvania. He was the nation’s founding capitalist and the financier of its revolution. At a young age, Robert Morris began apprenticing for Charles Willing at a shipping and banking company. After Charles Willing died, his son, Thomas Willing and Robert Morris became business partners. Robert Morris and Thomas Willing participated in shipping and property investments and turned their business, Willing, Morris and Co. into one of the biggest and wealthiest firms in the country. Where the demands were high, they would bring any product from around the world into Philadelphia. Robert Morris and Thomas Willing purchased ships to transport their goods. They sold grains and household products in Maryland and Virginia, as well as distributing flour and lumber to Europe, and importing sugar, dry goods, and molasses. As a side business, Robert Morris and Thomas Willing both participated in the slave trade. Willing, Morris and Co. would advertise where slaves were offered. One of the ships they purchased, the Nancy, had been used to make two trips to buy enslaved Africans with the purpose of reselling them in America. Their first trip was in 1762, and was the only somewhat successful trip the men had while participating in the slave trade. Willing, Morris and Co. sold approximately 170 slaves from Ghana in Wilmington, North Carolina, however, the men did not carry enough slaves to generate a large profit. The second slave trade did not go as smoothly and the Nancy was seized by French raiders. Ultimately, Robert Morris and Thomas Willing never profited from the importation and reselling of slaves and ended up losing money. After this occasion, both men got out of the business. Robert Morris and Thomas Willing then went on to handling slave auctions for other importers. Within seven auctions, they offered a total of 23 slaves. For these auctions, Robert Morris and Thomas Willing would advertise free round-trips from Philadelphia to Wilmington, Delaware for the people that wanted to attend the sales. In 1762, Willing, Morris and Co. had an agency sale in Wilmington, Delaware where they advertised for 100 Gold Coast slaves. The final agency sale that Robert Morris and Thomas Willing was in 1765. At this time, 70 slaves were imported from Africa and were advertised to be sold in Philadelphia, however, the owner of the ship took the slaves to Jamaica instead of being resold. In addition to the involvement in slave trade, and slave auctions Robert Morris and Thomas Willing also purchased an indigo plantation which was called Orange Grove, at Baton Rouge, on the border of the Mississippi River. Orange Grove consisted of 3,000 acres of land. The men placed an overseer with 40 enslaved Africans that worked on the plantation. After Spain took Louisiana from France, the land fell within Spanish dominion and both men lost the title. Robert Morris and Thomas Willing were ultimately able to keep and sell the enslaved individuals but lost the plantation and buildings that were constructed upon the land. The whole endeavor ended up being unsuccessful. At the height of the slave trade in Philadelphia, a total of 500 slaves were imported into the city in 1762. Most of these slaves were brought in by three men from Rhode Island. These men were named, D’Wolf, Aaron Lopez, and Jacob Rivera. A petition was co-signed by Willing, Morris and Co. This petition aimed for the repeal of Pennsylvania’s tariff on imported slaves. Robert Morris also pushed to tax individual slaves which would be payable by slave owners, but his efforts were repelled by the southerners who strongly opposed his ideas. Aside from the close relationship Robert Morris had with Thomas Willing, he also had an amicable relationship with George Washington. Washington wrote to Morris, in 1786, discussing his intentions to bring an end to slavery and in 1780, Pennsylvania passed a law for gradual abolition of slavery. The first census that listed slaveholders by name was in 1790. During the time the census was conducted, Morris was listed as having no slaves to his name. In conclusion, Robert Morris was a Founding Father and was very much connected to the slave system. He had one or two household servants, but his partnership with Thomas Willing led to active participation within the slave trade. The men imported slaves, then went on to handling slave auctions for other importers and even used enslaved individuals for work on their plantation. As an individual, he fought to tax slaves which would be payable by their owners, but because of southern repeal, he never gained additional support. DiStefano, Joseph. “Descendant’s Rebuttal When Wachovia Disclosed the Link between Slavery and Its Founders, Rob Morris Decried It as an.” Philly.com. 12 June 2005. Web. 26 Feb. 2015. <http://articles.philly.com/2005-06-12/business/25438923_1_slave-trade-robert-morris-wachovia&gt;. Lawler, Jr., Edward. 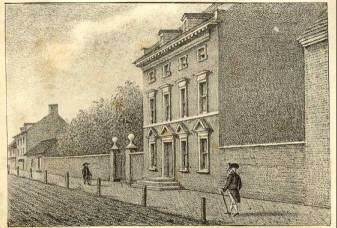 “A Brief History of the President’s House in Philadelphia.” Ushistory.org. Independence Hall Association, 1 May 2010. Web. 2 Mar. 2015. <http://www.ushistory.org/presidentshouse/history/briefhistory.htm&gt;. Messett, Kevin. “Robert Morris.” Robert Morris. Web. 26 Feb. 2015. <http://pabook.libraries.psu.edu/palitmap/bios/Morris__Robert.html&gt;. Morris, Robert. Account of Robert Morris’ Property. Philadelphia: King & Baird Printers, 1734. Print. Nash, Gary B. Forging Freedom the Formation of Philadelphia’s Black Community, 1720-1840. Print. “PENN BIOGRAPHIES.” Thomas Willing (1731-1821), University of Pennsylvania University Archives. University of Pennsylvania University Archives and Records Center. Web. 26 Feb. 2015. <http://www.archives.upenn.edu/people/1700s/willing_thos.html&gt;. Rappleye, Charles. Robert Morris: Financier of the American Revolution. New York: Simon & Schuster, 2010. Print. “Robert Morris Jr.” Robert Morris Jr. Web. 27 Feb. 2015. <http://www.lostpine.com/passions/RobertMorrisJr.html&gt;. “RootsWeb: OBITUARIES-L [OBITS] Robert Morris (financier).” RootsWeb. 1 Jan. 2014. Web. 5 Apr. 2015. <http://archiver.rootsweb.ancestry.com/th/read/OBITUARIES/2009-06/1245423700&gt;.